Politics in India has certain unique characteristics which can hardly be found elsewhere and one element which has drawn quite a formidable amount of attraction is its practices of visual culture, countless wall posters, graffiti, giant sized cutouts and billboards form the oeuvre and decorate the landscape. Each of these practices has a specific historical connection related to its landscape. 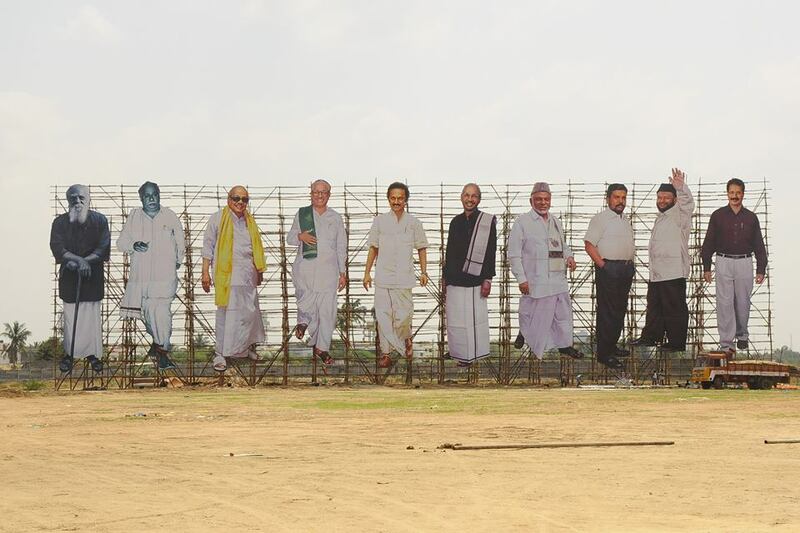 The culture of having giant cutouts is one such unique practice of visual culture specific to a geographic location; something the academicians, journalists and political commentators relate with the southern state of Tamil Nadu in India. A similar form of aesthetic but in a more concrete form of structure that comes to mind is the gargantuan Soviet era-statues, which weighed more than 40 tons and stood 25 feet high and above. Cutout culture, which thrived on the cinema-politics nexus, facilitated the emergence of cult figures, mythical heroes, charismatic film stars and politicians. Cutout is a term that defined the distinctive political culture of Tamil Nadu in South India. This investment on the visual aesthetics of displaying flamboyantly coloured giant size cutouts adorning the cityscapes was a contribution of the Tamil film industry and the state’s major Dravidian  political parties who primarily used these cutouts. Cutouts are pieces of plywood board, which are hand-painted on canvas; aesthetically shaped and erected on main junctions in the cities, they became a powerful vehicle to promote iconicity in contemporary Tamil culture. This form of cutout culture fueled ideas of devotion and charisma. “wall writing regardless of parties was the single most visible material sign of political activity in the state. The activity used and perfected for over more than half a century, became an essential aspect of West Bengal’s political culture, in the same way that giant cutouts characterize the public political culture of Tamil Nadu” . Giant cutouts mostly 40 to 70 feet tall where famous movie heroes or political leaders in action or waving their hands or with folded hands could be seen erected at prominent spots in the city, these cutouts in a towering height also brings into play the idea of Darshan a ritualized aspect of Hindu culture where the devotee gazes at the deity and seeing his/her image the devotee in turn becomes object of the deity’s gaze, here the filmstar or political leader is seen as god like. This also defined both the popularity of the leader and their power, and most importantly like wall posters it also gave an opportunity for the cadres to showcase their loyalty but with a little more cost pinching their pockets. Preminda Jacob  who studied these cutout images found out that cutouts crafted a charismatic personality for the film star leaders of political parties and enabled the amplification of that charisma throughout the public sphere. She saw the rise of iconicity of Jayalalitha  in a series of carefully orchestrated cutout portraits during the 1990s, the already popular image of her as a film star combined with her political persona and gave her a demigod status and the visual cutout culture was significant in constructing this status. The years after the ‘Talkie Era’ of 1930s was when the painted signboards came into prominence, and by 1940s cutouts largely put up by the film industry surfaced to decorate the landscape and with the emergence of Dravidian parties in the 1950s the cutouts became larger in size and shape. For instance during the release of actor Sivaji Ganesan’s film Vanangamudi in 1957, Mohan Arts handcrafted an impressive 80-foot cut-out at Chitra theatre in Chennai city. This was said to be the tallest standee ever made in Asia at the time claimed Harinath, son of Mohan who designed the cutout. This form of visual aesthetics was influential in Dravida Munnetra Kazhagam (DMK)’s plebeian forms of political culture and took them straightway to the masses. DMK’s close nexus with the film industry amplified these forms of larger than life structures on the public space. A political visual aesthetic primarily seen as a DMK culture infiltrated too fast and was replicated by AIADMK (All India Anna Dravida Munnetra Kazhagam) Congress and other smaller political parties in the state . This visual extravaganza called the cutout culture was nothing but an extension of aesthetic display started and pioneered by the DMK in its annual conferences where smaller cutouts were used to decorate the stages and podium which were built embodying a sense of Tamil glory and golden past invoking historical figures or events from the past. Another important facet of this visual culture are the fan clubs, a phenomenon much popular in Tamil Nadu, fan clubs also gave a fillip to these forms of visual culture during the 1960s till recent times where giant cutouts were put up during the release of films of top stars. These cutouts were erected largely in front of theatres and a few important spots, the most prominent during the 1980s and 90s was Gemini Flyover in Chennai. The cutout scenario in Tamil Public Space reached its peak during Jayalalitha’s maiden regime as Chief Minister from 1991 to 1996, it saw a proliferation of giant sized cutouts, Bernard Bate cites AIADMK as the most extravagant in its use of cutouts and says are, “unparalleled in their ostentatious semeiotic occupation of a city ” . By the end of 1990s there was so much of outcry about this emergent cutout culture and was lamented by AIADMK’s political rivals, DMK being the prominent. This dissent along with the emergence of technological advancement to reproduce images digitally saw the slow demise of cutouts paving way for vinyl billboards. However during the recent past one could see its slow emergence courtesy the DMK, which has used cutouts in its recent state conference held in Tiruchi giving them a possible opportunity to distinguish them from the existing digital culture. Mohan a cutout artist in Chennai said that the cutout culture has invaded other cities, but in Tamil Nadu, the birthplace of cutout culture, it’s hard to see one. “It was only during Jayalalitha’s time that we had a field day” . The last hand-painted Mohan Arts production was a cutout for the 2005 film Chandramukhi. It was raised on Anna Salai opposite the Buhari Hotel. The 2008 Supreme Court ban on all hoardings sounded the death-knell for an industry that once brought a degree of flamboyance to the city . The globalizing nature of Indian cities with a specific interest to attract foreign investors and rid this form of plebeian visual culture which has been seen by the managerial and middle classes as a form of visual pollution has gained judicial investment and moral support from media. Of late, though there has been a re-emergence in terms of practicing that visual aesthetic, but not to an extent of what one saw in the 1990s, however as a visual export from Tamil Nadu it is thriving in other parts of India. Dravidian parties include a range of regional parties which originated in southern state of Tamil Nadu during the colonial era espousing on the idea of Dravidian ethnic identity as an oppositional binary against Aryan supremacy. Dravida Munnetra Kazhagam (Dravidian Progressive Federation) and All India Anna Dravida Munnetra Kazhagam (All India Anna Dravidian Progressive Federation are the most prominent among the Dravidian parties. Both the Dravidian parties had people from film world becoming top political leaders thus contributing much to the cinema-politics nexus. Jacob, Preminda. 2009. Celluloid Deities: The Visual Culture of Cinema and Politics in South India. NewDelhi: Orient Blackswan. Jayalalithaa is a film star turned politician who joined the All India Anna Dravida Munnetra Kazhagam and rose to become the Chief Minister of the State three times since 1991. Rajadurai, S.V. and V. Geetha. 1996, ‘DMK Hegemony: Cultural Limits to Political Consensus’, in Sathyamurthy, T.V. (ed. ), Region, Religion, Caste, Gender and Culture in Contemporary India Delhi: Oxford University Press. pp. 559-72. Subramanian, Nirupama. 1994. Larger Than Life, India Today November.